Visit Our Thoroughbred Horses For Sale Site for Our TRACK PROSPECT HORSES! We have created a new web site to make it easy to see all the Prospect Horses (horses at the track or their owners' farm) at one quick view. Visit and bookmark www.thoroughbred-horses-for-sale.com to find pre-screened sound Thoroughbred sport horse prospects. These Thoroughbred horses for sale are still at the track or at their owners' farms. We usually do not have video and you are purchasing them sight unseen with a vet check. Read the page. "Buying a Track Prospect Horse" to understand the process. If you are not comfortable buying this way, please look at the horses in training at Bits & Bytes Farm or our Resale Horses. We have horses in all price ranges. Check out our page titled Pricing Information or read our FAQ page for answers to some of the most common questions. We do not give prices by e-mail. Please call for pricing. Dazzling Deputy is a 2013, dark bay, 16.2 hand gelding with a sweet personality. He seems to like racing but he is not winning. The vets have been all over him checking for anything that would make him not run well including scoping him for breathing problems. They can find nothing wrong with this horse. 'Deputy' does have some freeze fire marks from splints on the back of his legs that are very old and not an issue. He is a kind horse who loves to eat and enjoys his job but it is now time for him to find a new job. He is believed sound for any career including dressage, eventing or as a hunter/jumper. He might even make a good fox hunter with his solid build. He has run 36 times and he has on $64,728. He is eligible for the Retired Racehorse Project. His last race was on March 18, 2019. Dazzling Deputy has a dazzling pedigree with Giants Causeway, Storm Cat, Secretariat, Blushing Groom, Deputy Minister, Northern Dancer, Raise a Native, Hansel, Roberto and the great sport horse sire Dynaformer. Well bred horses tend to do very well in second careers. This horse has been well cared for and well trained which gives the buyer of him an advantage when retraining. No downtime necessary as he has no injury to rehab from. Please call for pricing. The price can go up or down depending on owner. We always check with the owner when someone is a serious buyer. Many times the price goes down to a really good home. We do not own these horses so we cannot control the pricing. We will not sell a horse to just anyone with the money. We carefully select the horses we sell and we work hard to make a perfect match. If you don't call, we cannot help you. We are not a rescue and our horses are not 'rescue priced'. Most horses are between $2500 and $4500 - some higher and some lower. Call and we can talk more our horses and let us help you find the perfect match. We take the gamble out of getting a Thoroughbred off-the-track. Learn more about how our Track Prospect Horses are priced on the main Bits & Bytes Farm website. Safe Passage aka ‘Paddy’ is a 2013, 16.1 hh gelding. He last raced on December 20, 2018. He has been enjoying some barefoot time being turned out and getting to be a horse. These pictures do not do him justice. He is a big boned good looking guy who moves so free from his shoulder and hip. He naturally oversteps at the walk. Again, he is barefoot and we had him trot up and down about 15 times on the asphalt and not once did he hesitate or take a bad step. He should make a fabulous dressage horse or maybe even an eventer. ‘Paddy’ carries himself like a much larger horse than he is. He does have some racehorse ankles of which the owner has x-rays. They will be included for release to anyone interested in him and can be compared to x-rays you will have done in a prepurchase exam. He retired sound. We feel that he is not for a novice first-time horse owner because he has real talent and should go to someone who can retrain him to his full potential. He has way too much potential to just sit around. 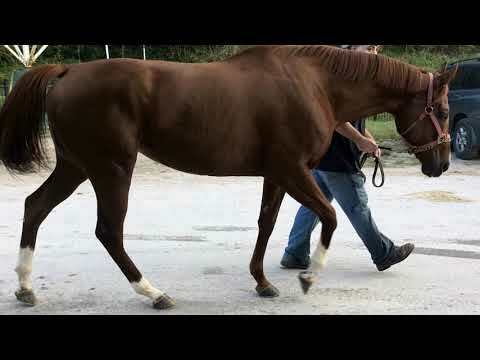 I’am a Hot Mess aka ‘Red’ is a 2014, 16 + hand high chestnut Thoroughbred mare. This girl is the complete package. She is thickly built and an easy keeper. She is great to ride on the track and absolutely loves to be brushed and handled on the ground. She is up-to-date on everything. ‘Red’ loads on a trailer quietly and she gives kisses to her groom when asked. We feel she would make a super nice upper-level horse. She is a chestnut mare, and yes they sometimes get a bad rap, but not this one. ‘Red’ is an exceptional horse and she should fit into any program. We feel that with all her talent she should most likely go to someone with experience at taking horses to serious competitions. This girl is the complete package and will take you far in the show world. Visit our website for more photos and information. Call 770-704-6595 to see if she might be a match for you. 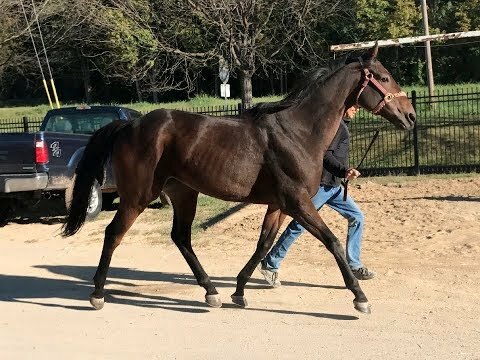 “Sarge” is a 2010, dark bay, 15'3+ hand Thoroughbred gelding for sale directly from the racetrack. This guy is just fabulous to be around. He is broke to mounting block and super laid back. He is clean legged with no blemishes and he has no vices. “Sarge” has a really huge stride for his size and a kind gentle laid back personality. “Sarge” may not have been overly competitive on the track, he has the athletic background to be a nice event horse, barrel racer or show jumper. He has a full sister who has gone on to be a top-notch polo mare. If you are looking to trail ride he would suit that too. “Sarge” is a well-rounded individual. “Sarge” had had no injuries or surgeries. We know his complete history. His owner/trainer/breeder has trained his grandmother, mother and all his siblings. How many Thoroughbred brokers online can tell you this much about the Thoroughbred they are representing? We have sold other horses by this owner/trainer and they went right to work with no issues at all. They were all as represented and passed their pre-purchase exams. This horse will be easy to transition to sport horse no matter what you choose to do. He is a super cool gelding who gallops with his head bowed kindly on the track. Easy to ride on-the-track makes for a horse that is easy to retrain. “Sarge” is eligible for the Retired Racehorse Project (RRP). Don’t wait too long to find your RRP prospect. The buyers are out looking now. The best horses will go fast. Let us help you find the perfect match. Bits & Bytes Farm takes the gamble out of getting an off-the-track Thoroughbred. Please call for pricing. We will not sell a horse to just anyone with the money and we don't send prices by PM or email. We carefully select the horses we sell and we work hard to make a perfect match. If you don't call, we cannot help you. We are not a rescue and our horses are not 'rescue priced'. Most horses are between $2500 and $4500 - some higher and some lower. Call and we can talk more our horses and let us help you find the perfect match. We take the gamble out of getting a Thoroughbred off-the-track. Learn more about how our Track Prospect Horses are priced on the main Bits & Bytes Farm website. 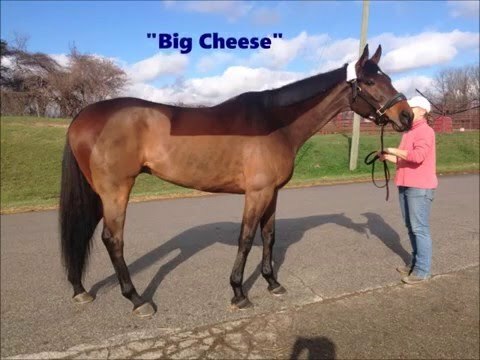 "Big Cheese” is a 2007, 16.1 hh Thoroughbred gelding. This is a super fun horse to ride. He is forward when you want him to be but will quietly stand at the track for an hour before he trains and he loves to train. His legs are clean and he is free of vices. He would make a super jumper or field hunter. We feel could jump the moon in the jumper ring and would fit in just fine in the hunt field. He is good with the blacksmith and walks right on a step up or ramp trailer. He does well with turn out and is broke to the mounting block already. He is one of his rider’s all time favorite horses to gallop. She has had a blast riding him over these past 15 months. He came off-the-track in February and is rested and ready for a new career.